Recreation | Campground "Le Moulin de Bidounet"
Mornings Sunday to Friday, the children’s club, open its doors with a qualified entertainer and proposes differents activities: creative workshop, painting, or outside games. From 8 years of age, children can be accompanied to a workshop for illumination and mosaic run by the Heritage Service. Contest of course! 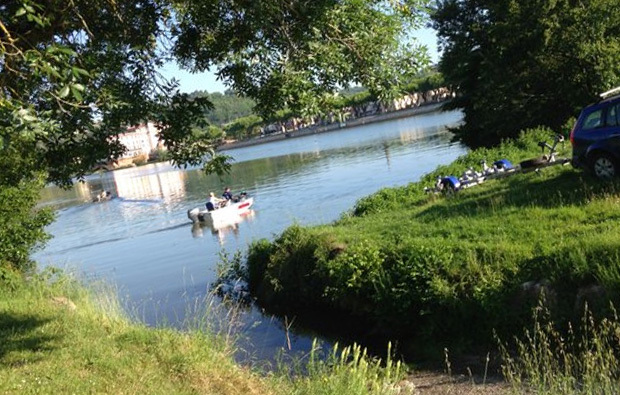 "Petanque and belote"
Fishing... the campsite is one of the most beautiful spots in the Tarn - with a beautiful launching ramp (3m wide) directly on site (we are in the process of obtaining the Fishing Reception label, a room is at your disposal for the live tanks). In July and August, the Moissac -Terres des Confluences Tourist Office will have the pleasure of inviting you to a welcome drink every Saturday evening from 6:30 pm to 8 pm to present your activities and everything there is to discover in Moissac and the surrounding area!